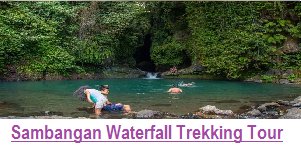 Full Day Trek in Sekumpul Village, by joining this tour package you will explore the Hidden Village in north of Bali with its 7 amazing hidden Waterfalls. Yes….! 7 waterfalls in one village! 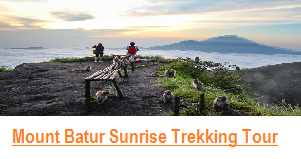 In this tour package, you will have the chance to visit a “Baliaga” village which is an old Traditional Balinese Village where native Balinese people live. You will also see an old Balinese Bamboo House as well as the process of how to make Brown sugar in a traditional way. For your lunch, we will take you to a local seafood restaurant where you will taste traditional seafood from a local village. Alternatively, if you just take the regular Package we will serve you a Lunch Box of Indonesian traditional Food. Sekumpul Waterfalls are said to be the most beautiful waterfalls in Bali. Perhaps, the beauty of the waterfalls is fairly close to that of Niagara Falls. Actually, there are two villages that claim the waterfalls, namely Sekumpul and Lemukih. The two Villages are indeed neighbors. To be able to see Sekumpul Waterfalls closely, a little efforts and struggle are needed. From the parking area, you have to walk quite far away, walking down on a slippery road, down hundreds of stairs, and cross a river. If you go there by a motorbike, you can still ride it from the parking area or the ticket counter, to the end of the paved road. At the end of the paved road, then you have to walk on a narrow dirty path. Not far down the path, you will arrive at a gazebo. The incredible lure of the beautiful waterfalls can be seen from the gazebo. The scenery of Sekumpul waterfalls can be seen in a certain distance from here. The range of the seven waterfalls makes it different from most waterfalls. Sekumpul waterfalls are not just made up two or three waterfalls. There are at least seven waterfalls which are located separately and apart. This wonderful scenery you can see from the gazebo. The seven waterfalls are beautifully scattered in the high cliffs and surrounded by green trees that soothe visitors’ eyes. Each of the seven waterfalls has a different shape and height. This is absolutely amazing! As a result, Sekumpul Waterfalls are crowned as the most beautiful waterfalls in Bali. 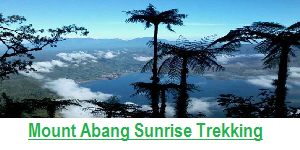 In this Trekking tour you will pass through several local people’s houses, Temple, a Historical Monument, Beautiful rice field and so many fruit trees around the village. It seems that people around this area really like to grow trees. Surely, it will impress you. There are Durian and rambutan trees everywhere. After walking around for five minutes, we can see several waterfalls from a distance. What a wonderful experience! Yes! Those seven natural waterfalls in this green tropical area.You will cross a river and trek through the jungle a bit, before we finally arrive at the base of the twin waterfalls. Around the base of the twin waterfalls, you can enjoy swimming and playing with your friends. 08.30 to 09.00 a.m. – arriving at the trekking point and starting the Trek – Firstly we will go walking through Clove Plantations, Cacao, plus some local fruit plantations. Then, we will enjoy visiting an old unique temple and an old Monument. 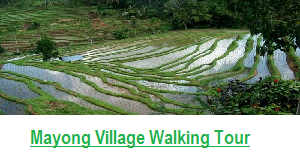 Before arriving at the waterfalls where we can enjoy swimming, we will go on walking through the rice fields. 12.30 p.m. – The Trek Finishes. Then we will continue our trip to Lovina beach for having lunch at a local sea food restaurant. 01.30 P.m. – Taking a rest while having lunch before we continue our trip to visit a Baliaga Village. 03.30 p.m. – Observing the process of how to make brown sugar and witnessing some old houses belonging to the real local Balinese people. 08.30 to 09.00 a.m. – Firstly we will go walking through the Clove Plantations, Cacao , plus some local fruit plantations. After that we will visit an old unique temple, an old Monument. We will continue walking through the rice field before arriving at the waterfalls where we can enjoy swimming. We will also prepare Local Food for lunch plus Fresh coconut water for your refreshment. 01.00 p.m. – The trek finishes. After that we will take you back to your hotel. However, if you are willing to visit some interesting spots on your way back to hotel; we will be excited to arrange it for you. Just remember to bring some small money for the entrance fee. 04.00 p.m. – Arriving back at the hotel where you stay. 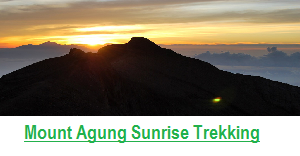 The cost of this Exclusive Package is USD$59/person for Minimum 2 persons booking. 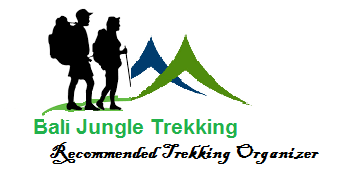 The cost includes Return transfer with a private air-conditioned car, Private Local Trekking Guide, Refreshment of some local fresh fruits during the trek, drinking water, entrance fee to Sekumpul waterfalls, Brown Sugar, Lunch at a Local sea food restaurant, and donation to a Baliaga village. 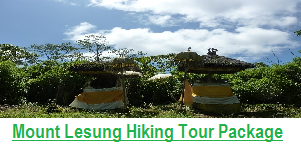 The cost of Regular Trekking tour to Sekumpul Village is USD$53/Person including Return transfer with a private air-conditioned car, Private Local Trekking Guide, Refreshment of some local fresh fruits during the trek, drinking Water, entrance fee to Sekumpul waterfalls, and a box of lunch.